It was my first 100 mile run the weather was warm and raining. As always the start to any run is quite difficult, instead of going through the correct trail my leader Ringo decided to stay left and miss the turn so, I had to dip under a metal rope and ride through at least two feet deep snow to get onto the correct trail. After that it was smooth “sledding” until my dad thought we had missed the turn, we had ended up having to turn around two different times just to have it be that his leader Denali was right all along. Subsequently, we hit the Yetna river and were on the right track. With my eight dog team trailing close behind my dad’s 9dog team he allowed me to pass him and I was out on my own the rest of the way. My team; Ringo-Vela, O’dale-Sidney, Casper-Shifter, and Ragnar-Zero were running great there butts moving quickly and their faces huge with smiles. We soon reached our turn off for Yetna station we then pulled up the hill parked the teams and got to unpacking our gear. Little did we know our cookers wouldn’t work so we had to get hot water from the station and sit and wait. Well, while we waited Dandy on my dads team chewed through his tug line and shortly after O’dale on my team chewed through both my leader tug lines. As of result we couldn’t eat at the station we had to feed, create make shift tug lines out of neck lines and head on home. Furthermore my dad let me lead again but Ringo had taken a wrong turn and we had to cut across very deep snow. Poor Ringo got attacked by Shifter in the process. So once we go through the huge patch of thick snow my dad switched Ringo with one of his leaders Ty-Ty and gave her to me. Now finally that everything was running smoothly we were home bound for the long journey of six straight hours in cold weather and pouring rain without stopping except for a couple minutes of rest here and there. Ty-Ty was doing pretty well for her first 100 mile run, her only issues was on open trail she weaved to much otherwise she was doing pretty well. Finally we got to the big hill my dogs trucked on and non-stop pulled me up the hill and were very happy to know they were close to being home. We were back at Deshka Landing and began unhooking in rain and ice. We packed everything up got all the dogs in the truck and headed home on the even icier roads. Shivering and wet we unpacked put the dogs back on there poles so they could go to bed. We were finally home; exhausted, hungry, thirsty, wet, and cold I stepped into the warm laundry room and pealed off all the wet clothes and headed up to my room. As to say my first 100 mile run wasn’t as bad as I had thought I had loads of fun and enjoyed my deep bounding with my dogs. I know now that for Willow 100 it’ll just be a great time. 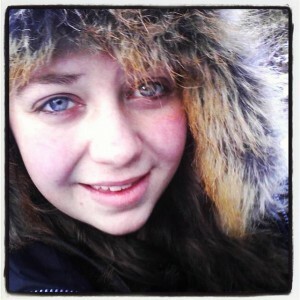 Nicole is a junior musher at Team Ineka and is going to run her first 100 mile race, the Willow Junior 100 in February.